Consumer watchdog WhichIts investigation of 500 refrigeration appliances found backing material on almost half was made of unsafe plastic.Which? 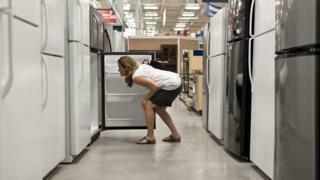 has labelled 250 models "don't buys" and is recommending consumers do not purchase plastic-backed models.It says a number of plastic-backed models sold as "flame-retardant" could also speed up the spread of a fire.All plastic-backed fridges, freezers and fridge-freezers on the market pass current safety standards but Which? says the tests are "inadequate, not fit for purpose and do not come close to replicating the source of a real house fire". The current British Standard requires refrigeration appliances to pass a glow wire test to assess their fire resistance. This involves putting a hot wire through a sample of the fridge or freezer backing material to determine if it catches alight.However, when conducting more stringent fire tests, Which? found that no plastic backing sample was able to withstand a flame for 30 seconds.In the event of a fire, it would not sufficiently prevent the flame from reaching the flammable insulation used in all fridges.In similar testing of metal and aluminium laminate-backed fridges, none caught alight after the 30-second test. Samples of metal and aluminium laminate backing less than 1mm thick were also able to withstand an open flame for a full five minutes. Which? chief executive Peter Vicary-Smith said: "People will rightly be outraged to learn that manufacturers and retailers are selling potentially unsafe products that could be putting their lives at risk. "If manufacturers and retailers fail to act and leave plastic-backed fridges, freezers or fridge-freezers on sale, the Office for Product Safety and Standards must step in and take action. "Fires due to faults with refrigeration appliances are rare, with recent Which? research analysing UK fire statistics suggesting that they are responsible for just 8% of domestic fires.A spokesman for the Association of Manufacturers of Domestic Appliances said fires starting in fridges was extremely rare. "All appliances on the market have to be safe and tested to the rigorous safety standards prevailing at the time. These standards are continuously revised," he said. "The aim of the latest revision in relation to refrigeration, now being rolled out around the world, is to improve fire retardance in case a fire starts elsewhere in the home. "A Department for Business spokesman said the UK had some of the world's strictest safety laws for white goods and the government was working with Which? and other groups to see if standards could be made even more stringent.